← Walsh stands tall: now how about Boston 2030? What kind of animal would kill this lion for sport? Walter Palmer’s pleasure in life is apparently hunting and killing large animals, legally or illegally. In the last few days, millions of people around the world have come to know that the American “sportsman” has slain Zimbabwe national treasure Cecil, a magnificent 13-year-old black-maned lion, whom tourists came from far and wide to see. Palmer’s guides illegally strapped animal carcass on their vehicle to lure Cecil outside the Hwange protected reserve, enabling the 55-year-old Bloomington, Minnesota dentist to hit Cecil with a bow and arrow, (also a violation of Zimbabwean regulation). It took 40 hours of suffering till they tracked, shot and killed him. This wasn’t about putting Cecil out of his misery; it was presumably about getting a specimen to mount for the wall of the dentist’s den or entertainment center. What kind of person does that sort of thing? Someone who can ante up the $50,000 to pay his guides for the “sporting” trip. Someone who can claim with bald-faced indifference that he thought what he did was legal. Someone who in 2009 had run afoul of the law in the United States for illegally killing a bear and had been fined for his indulgent transgression. I can’t say I feel bad that the good dentist has been forced to close down his dental practice because of what he did and the international outrage he has provoked. According to the National Geographic, Africa’s lion population has been reduced from 200,000 to just 30,000 due to poaching, destruction of habitat, conflict with farmers, and desertification. Cecil wore a collar, put on him by Oxford University researchers tracking him for data on lion conservation. (It is also illegal to hunt a lion wearing a collar.) Despite (or perhaps because of) the declining lion population, this feline population understandably attracts tourists to the country. Zimbabwe, with its nominal regulation of trophy hunting, still enjoys the $20 million a year (3.2 percent of its tourism revenue) brought in. Thursday the United Nations General Assembly called for global cooperation in curbing the poaching that has decimated world wildlife, from lions to the elephants and rhinos sought for their ivory tusks and horns. According to the NY Times’ Katie Rogers, President Obama reportedly discussed it in his visit to Kenya last week. He is also seeking to introduce bans on commercial trade in ivory in U.S. treaties, including the controversial Trans-Pacific Partnership. Under a 2013 executive order a tightening of the Endangered Species Act, The U.S. Fish and Wildlife Service has created some limited exceptions to its rules, including certain musical instruments (the tips of violin bows and piano keys, for example, and furniture pieces containing fewer than 200 grams of ivory, which are not deemed to have contributed to the current poaching crisis. Unlike Australia, the United States doesn’t ban imports of illegal bounty like Cecil’s head. As the world was reacting to the good doctor’s savagery, rangers in Kenya’s Tsavo West National Park discovered the handiwork of poachers who had just killed a mother elephant and four children. The elephant population is even more at risk than the lions. As reported by the Washington Post’s Kevin Sieff, their tusks were hacked off, torn out of their heads. According to Sieff, poachers killed more than 100,000 elephants between 2010 and 2012. Illegal wildlife trade, he notes, accounts for between $7 billion and $10 billion a year. My husband and I saw our first elephant in the wild on photographic safari in that same Tsavo West National Park in 1984. Their power and majesty, the intimacy of their family groupings, are indelibly etched in our minds. So, too, the magnificent lions we saw in the Serengeti. 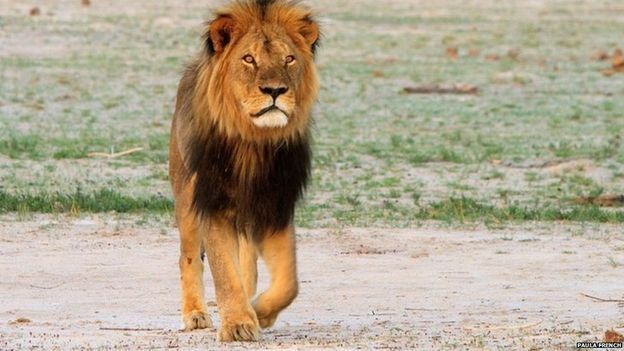 Zimbabwe’s government is seeking the extradition of Cecil’s slayer, Walter Palmer, and the United States government is weighing how to respond to that request. The dentist is nowhere to be found. He has “gone underground,” possibly feeling endangered by the anger his actions have provoked. (Maybe he has shifted habitats to his winter place in Marco Island, Florida.) Perhaps he has learned a little something about what an animal feels like to be hunted. One can hope that the worldwide outcry about Cecil’s slaying will help generate sustained action on wildlife destruction and focus attention on the government of Zimbabwe, which crafts rules to protect animals but brutalizes its biped population. Those who are placing teddy bears and stuffed lions in a memorial to Cecil in the doorway to the River Bluff Dental Clinic in Bloomington should also feel more than a modicum of concern for the people of Zimbabwe. This entry was posted in Culture, Politics, Uncategorized and tagged banning commercial trade in vory, Bloomington Minnesota dentist Walter Palmer, Cecil the lion, endangered species, Hwange protected reserve, MinnPost reporter Mark Porubcansky, National Geographic, NY Times reporter Katie Rogers, Oxford University research on lion conservation, poaching big game in Africa, President Obama trip to Kenya, President Robert Mugabe, US Fish and Wildlife Service, Zimbabe corruption and repression, Zimbabwe hunting regulations. Bookmark the permalink.